So many trips to Israel, and so few chances to photograph Papilio Machaon Syriacus. I’d think of how pleased I’d be to bring you a good image of these swallowtail butterflies, found throughout the Middle East. That was tempered by how difficult it is to shoot a butterfly like this one, a butterfly that refuses to allow you to approach it. The excitement that I experienced here was electric. I was on a trail at Ramat Hanadiv, the heavily visited wildlife preserve north of Tel Aviv, and very close to the Mediterranean Sea. These yellow blooms were aplenty along the trail, and he flew in to nectar. He must have been very hungry, for he allowed me to approach (robotically) and he tolerated my many shutter clicks. Fresh, spectacular and for several moments, tolerant. The yellow, the black, the blue and the red-orange . . . Yummy! Jeff hopes to return to Israel in 2020. Jeff, Thankful. 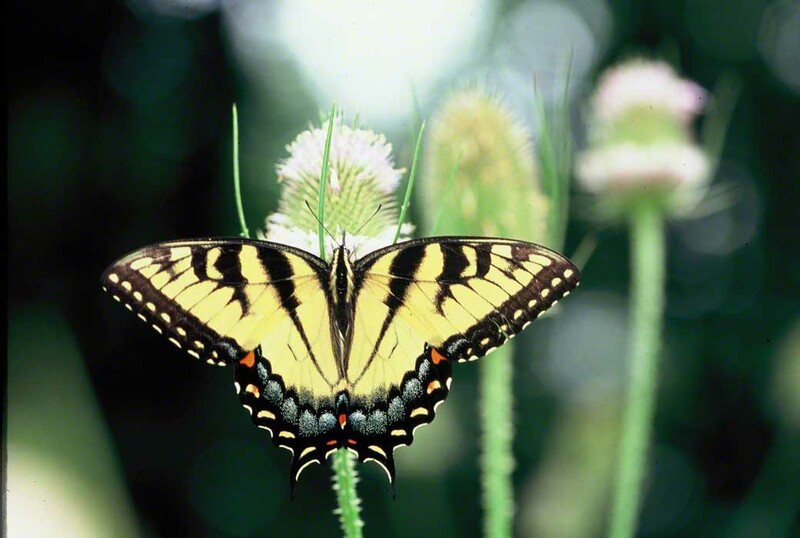 This female Easter Tiger Swallowtail Butterfly remains one of my viewed wingedbeauty images, ever. Taken at Raccoon Creek State Park in southwestern Pennsylvania, some nine hours west of the Empire State Building in New York City. One of my most viewed ever. Do be so kind as to share with me. Why have so many of you taken the time to have a look at this particular butterfly? I must have dozens of vivid memories of butterflies and where I first met them. Maybe it’s more than a handful of dozens of strong memories of first meet-ups. That Gulf Fritillary in the Outdoor Gardens of the Phipps Conservatory in Pittsburgh. A Gulf in Pittsburgh!! Those 2 Harvester Butterflies in Raccoon Creek State Park, Pennsylvania. The Goatweed Leafwing in that same Raccoon Creek State Park. I was so startled to see it on that tree trunk, that I forget to put my camera to work!! The Southern and Creole Pearly-eyes in Piedmont National Wildlife Refuge. The Zebra Swallowtail butterfly in Mason Neck State Park in Virginia. The Malachite and the Erato Heliconian butterflies in the National Butterfly Center in Mission, Texas. A standout first saw was that morning when I came upon the most gorgeous Tawny Emperor ever, again in Raccoon Creek State Park. This Palamedes was one of the first I’d ever seen, this time in 2016 in Big Bend Wildlife Management Area in the Florida Panhandle (northern Florida). They were huge and they adored the thistle seen here. There were many of them. When they’re fresh the black of their wings in brilliant jet black and bedazzles. I’m booked to return to Big Bend and St. Marks National Wildlife Refuge in just a few months. I can hardly wait to reunite with Palamedes Swallowtails, Georgia Satyrs, Goatweeds, Great Purple Hairstreaks and all of those Skippers that are so difficult to ID. Yet another destination this year might be Okefenokee Swamp. Oh, who might I see there? Pretty Palamedes?